This is the last of six posters in the Flocking Diplomats series by Joris Maltha and Daniel Gross, founders of design firm Catalogtree. Each poster in the series of information graphics is a different visual representation of the same set of data, allowing the viewer to engage with the information through a different lens each time. Posters focus on time of day, day of the week, and frequency of parking violations incurred by diplomats in New York City. 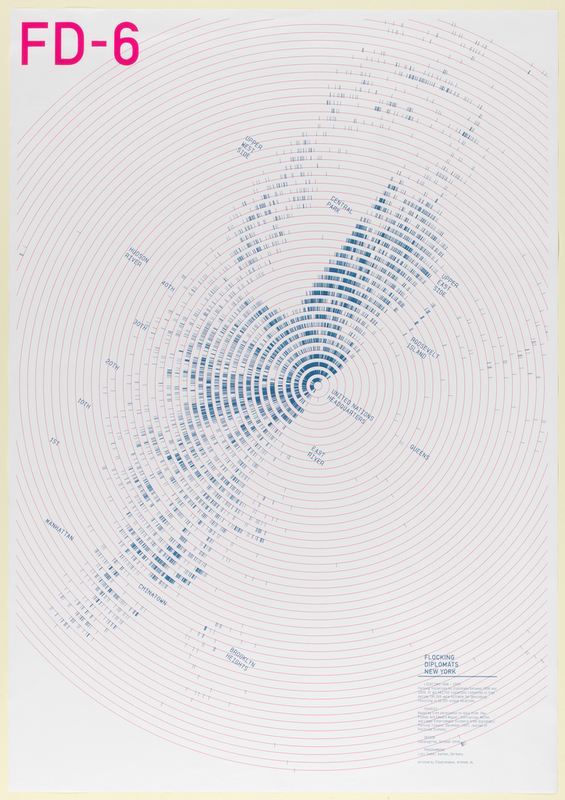 In this poster, data is translated into a graphic that maps the violations geographically. This data visualization is an example of designers using code as a design medium. Across different disciplines, designers are increasingly exploring the use of programming as an alternative creative tool to generate innovative forms and grapple with the immense amount of data available today. Each tick on this poster is a data point marking a parking violation incurred by a diplomat in NYC between 1998 and 2005. What would be impossible or at least extremely tedious using traditional graphic design tools becomes feasible with looped programming techniques that plotted 141,369 geo-coded data points. The resulting 16,355 unique locations paint an abstract form of Manhattan either emanating from or pointing at the “source”—the United Nations. Data visualization enables viewers to experience data and connect with statistics in a way that is different from reading numbers on a page, allowing us to see otherwise hidden patterns and even find humor in parking tickets. Cristina Cannella is a Digital Design Fellow in the Department of Drawings, Prints & Graphic Design at Cooper Hewitt, Smithsonian Design Museum. Cristina is currently pursuing her master’s in interaction design at NYU Tisch’s Interactive Telecommunication Program (ITP).